Composers, like pearls, are of three chief sorts, real, artificial, and cultured. David Diamond is unquestionably of the first sort; his talent and his sincerity have never been doubted by his hearers, his critics, or by his composer colleagues. Welcome to the official David Diamond website. This site is devoted to the life and compositional genius of David Leo Diamond, who was born in Rochester, NY on July 9, 1915 and died there on June 13, 2005, just a few weeks shy of his 90th birthday. The website contains information about Diamond's life and compositions as well as upcoming performances of his works around the world. As the site continues to grow, it will ultimately provide a complete listing of published works. 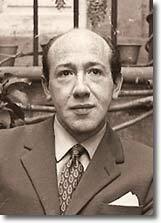 A complete list of recordings featuring the works of David Diamond is available on this site. Browse the recordings, listen to excerpts and read the reviews. This site will be updated on a regular basis with stories about Diamond's life, news and rare photos from his personal collection. We invite you to contact us with your your stories, photos and tributes for inclusion on this website. The Library of Congress has just released this rare 2 hour and 51 minute video of David Diamond being interviewed by composer Ellen Taaffe Zwilich recorded on October 15, 1995 at Carnegie Hall..
Click here to read an article by Kile Smith of WRTI 90.1 about the David Diamond Centennial. The link also features a video performance of Diamond's most popular work, Rounds for String Orchestra with David Hattner conducting Camerata PYP of the Portland Youth Philharmonic. We wanted to share with you some wonderful audio interviews with David Diamond as well as clips from some of his early works and later compositions. Click here to visit our newest page.